In a recently published JCTC article Jan Vicha and coworkers explain the SO-HALA (Spin-Orbit Heavy Atom on the Light Atom) NMR chemical shifts across the periodic table based on relativistic DFT calculations with spin-orbit coupling ZORA in ADF. General electronic-structure principles and mechanisms that dictate the size and sign of the SO-HALA (Spin-Orbit Heavy Atom on the Light Atom) effects on NMR chemical shifts were discovered and explained. In brief, partially occupied HA valence shells induce relativistic shielding at the light atom (LA) nuclei, while empty HA valence shells induce relativistic deshielding. 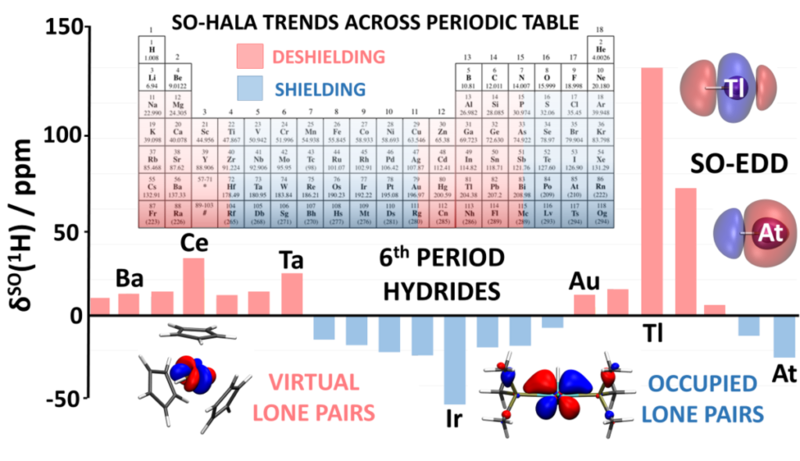 Hence, the LA nucleus is relativistically shielded in 5d2-5d8 and 6p4 HA hydrides and deshielded in 4f0, 5d0, 6s0, 6p0 HA hydrides. This explains periodic trends in the 1H NMR chemical shifts along the 6th-period hydrides (Cs-At) studied in this work and has a general validity across whole the periodic table. It can be extended also to non-hydride LAs. Further, SO-HALA NMR chemical shifts were linked to Spin-Orbit-induced Electron Deformation Density (SO-EDD), essentially a SO induced changes in electron density. SO-EDD provides an intuitive understanding of the SO-HALA effect in terms of the depletion/concentration of the electron density at LA nuclei. The complex question of the SO-HALA NMR chemical shifts becomes easily understandable for a wide chemical audience. Jan Vícha, Stanislav Komorovsky, Michal Repisky, Radek Marek, and Michal Straka, Relativistic Spin–Orbit Heavy Atom on the Light Atom NMR Chemical Shifts: General Trends Across the Periodic Table Explained, J. Chem. Theory Comput. 2018.